“As the California death toll rises our Sadist-in-Chief is spending $220 million to send troops to the border for nothing. That’s one way to get rid of Democrats. This is no longer politics. This is manslaughter,” Jim Carrey captioned his tweet, which featured a gruesome painting depicting a chard person wearing a “Go Rams” t-shirt. 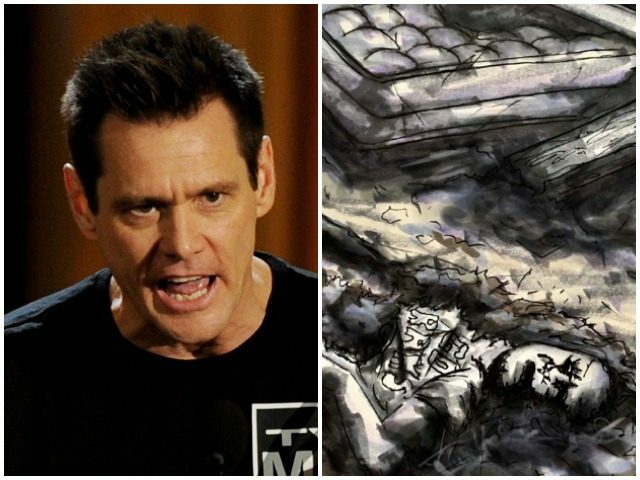 These strange political paintings from Carrey have escalated recently, as the Ace Ventura star has taken to posting his political drawings on Twitter, usually to criticize President Trump or his administration or his children. “Shameless lies. Endless indictments. The rise of racist hate groups. Kidnapped children. Contempt for rule of law – and quite possibly TREASON. Let’s end this ill-wind that’s blowing America off-balance and turning us against each other. VOTE DEMOCRAT!” Carrey said. While not busy with his artwork, Carrey has been advocating socialism. “We have to say yes to socialism–to the word and everything,” the Dumb and Dumber star said in September on HBO’s Real Time.